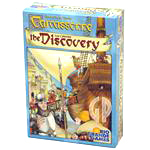 Drake says: "This expansion offers new challenges for fans of Carcassonne. The Cathedral triples the value of a city, and the Inn doubles the value of a road - but only when they are completed. Players may use the new large follower to double their chances of controlling a city, road, or field. This expansion also allows a sixth player to join in the fun. Finally, there are 6 point tiles to make scoring easier when players score more than 50 points." John says: "This expansion is a must-have! With Inns & Cathedrals, roads can become just as valuable as cities if not more, therefore adding more strategy to the game. 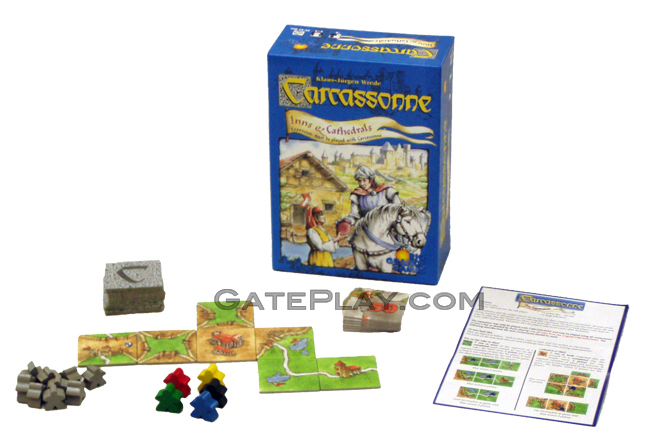 Once you add this expansion in, it's likely that you won't want to play Carcassonne without it." The first large expansion for Carcassonne, Carcassonne: Inns and Cathedrals adds several new interesting options to gameplay, while retaining the basic game's ease and enjoyment. More pawns in a new color are added, allowing up to six players to play; and a "large" pawn of each color is included, which if strategically placed will allow a player to dominate a city or road. Inns are included which double the points of a road, and Cathedrals increase the value of cities; but both will cause a player to score no points if the city or road is not completed by game's end. A new array of tiles is also included, with various combinations to allow players to better complete the map. Inns and Cathedrals will change the way players play the game, giving them more tiles and more fun! Check out "Carcassonne - Inns & Cathedrals" on BoardGameGeek.com!